Following his recently announced departure from the Red Hot Chili Peppers, guitarist John Frusciante will appear with a number of artists on an upcoming David Bowie tribute album. Frusciante is teaming up with the band Swahili Blonde (led by percussionist/vocalist Nicole Turley) for a cover of the Bowie song Red Money. 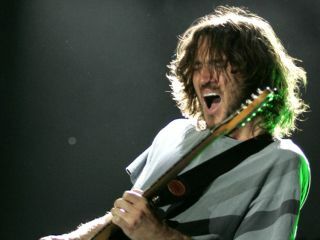 It will be interesting to hear how Frusciante and Swahili Blonde tackle the song, as it's had something of an odd history. It began as Sister Midnight, with music written by Bowie and guitarist Carlos Alomar and lyrics by Iggy Pop, and appeared on Pop's 1977 album The Idiot, which Bowie produced. In 1979, however, Bowie wrote new lyrics and recorded the song under the title Red Money. This version was featured on his album Lodger. The David Bowie tribute album will boast 28 tracks in all, with proceeds going to the charity Warchild. The set is due for release in May.